The Mayan Astrology Sign Kan is about the inner fire that is the basis of sexual energy and your life force. Kan is the creator of the universe. It's about all kinds of growth – human evolution, self-growth, spiritual development… It involves the orbit of the planets around the sun, time, knowledge, seduction, and wisdom. The Day Kan in the Mayan Calendar: This day-sign is a good day to increase physical strength, and to receive what you have lost or forgotten. It is a day when loved ones can return. It's a good day for spiritual growth, and to ask for your true love to come to you. 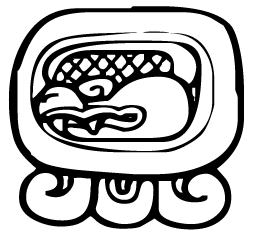 Characteristics of the Mayan Astrology Sign Kan: You do well in the face of adversity. You are a natural leader, but prefer to remain behind the scenes. You often underestimate your own value and are afraid of making a mistake. You are very intelligent and a natural athlete. Despite your great intelligence, you're more likely to find yourself the star athlete at school rather than the valedictorian. It isn't that you can't get good grades. It's that you have trouble sitting still, and sports give you the perfect outlet for all your energy. You're constantly reading and learning about everything you can. It's easy for you to put 2 + 2 together to create something entirely new. You are a perfectionist and want people to notice everything you do. You need people around you to support and protect you. It isn't that you're weak. You just prefer to remain in the shadows. You're so concerned about what others think about you that you can't bear for someone to criticize you. You are lucky in love. People are naturally drawn to you, so it's easy for you to always have a partner. Be careful not to lose yourself in flattery. Look beneath the surface to find what you need. You could do well as an astronomer, engineer, athlete, or scientist.